I tend to collect parenting books. Rearing Godly children is something I’m passionate about, so it’s difficult for me to pass up a book that might present a principle in a unique way or encourage me in my role as a mother. 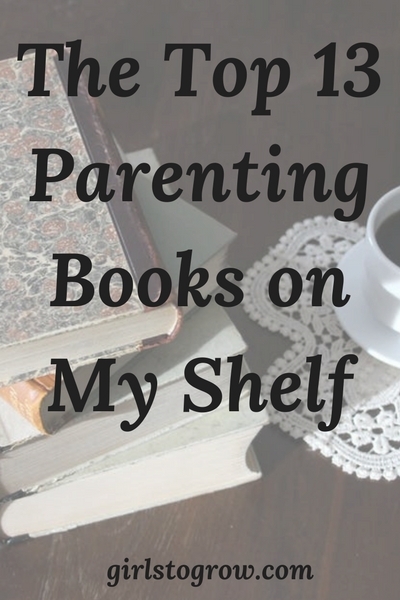 So on this Thursday I’m sharing thirteen of my favorite parenting books from the many that line one shelf of my bookcase. 6. On Becoming Childwise by Gary Ezzo and Robert Bucknam, M.D. Book that almost made the list: Making the “Terrible” Two’s Terrific by John Rosemond. As I reviewed these titles, I noticed that I’m drawn to books that help parents teach their children personal responsibility. Have you read any of these books? What other parenting books would you recommend? Several months ago I picked up The Birth Order Book by Kevin Lemam at the thrift store. I haven't read it yet, but look forward to ….once things settle down and I can focus again. What a great list of resources ~ thank you!! A few years back, our pastor gave the following book to each family in our church: "A Gift from God: Foundational Principles of Biblical Parenting". It's wonderful!! Yes, yes! I agree with you about enjoying parenting books. Babywise was a lifesaver when my kids were born. The Power of a Praying Parent is a beautifully wise book too. Thank you for the excellent list. I have Babywise, the 6 point plan, and a different Kevin Leman book…thanks for sharing your list…title #8 interests me! There is one book that I would recommend though – "The Olive Plants: Raising Spiritual Children" by Warren Henderson. It is *fantastic*. Here's the blurb from the back, to whet your appetite for it: "Most of the Christian children's ministry today is aimed at raising "moral" children. The teaching of right and wrong is necessary, but this agenda will fall pitifully short of producing "spiritual" children. Children must develop morally, physically, spiritually, emotionally, and academically, to really thrive and reach God's full potential for their lives. When children have a balanced development they lay hold on self-acceptance and self-awareness of their calling in God's master plan. In so doing, they gain a sense of importance and security – God is in control and has a plan for my life…. The Lord has plainly shown my wife and I that He develops parents as He raises up spiritual children for Himself – to this end, we praise God that children survive despite their parents." great list!! babywise and power of a praying parent are on my shelf – but there are a few that i need to go and google 🙂 thanks for sharing! !